Twin Casino makes online gaming twice as nice with double the action as you score Twin promotions and Twin support of course. Twin games with well over 700 unique titles to choose from! 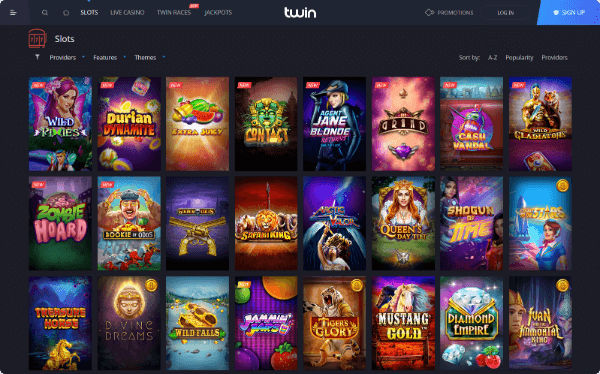 Become a Twinner and enjoy the latest releases from popular libraries such as Novoline, Yggdrasil, Play’n GO, Microgaming, Quickspin and much more! With everything from jackpot slots to live dealer games, we’re excited to present the Malta regulated casino that strives for double the action! Becoming a Twinner for the first time is an exciting experience as the welcome bonus greets you with more than just open arms. 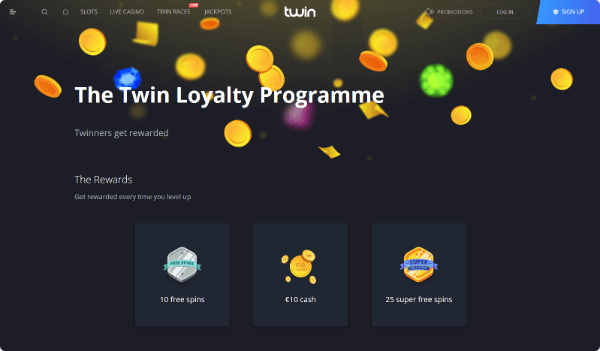 To ensure the “Twin” part of the casino shines bright, the team came up with a platform of special rewards, starting from the moment you join. The welcome package makes identical benefits available on both the first and second deposit, offering a 100% match bonus up to CAD$100. Therefore, within the first two deposits, you’ll score up to CA$200 in free cash, but it doesn’t end there. New players depositing a minimum of CA$50 will activate the 100% match bonus and receive an additional 50 free spins on the Dwarf’s Gone Wild slot. The extra free spins advantage is available with both deposits, offering up to 100 free spins with all the cash! 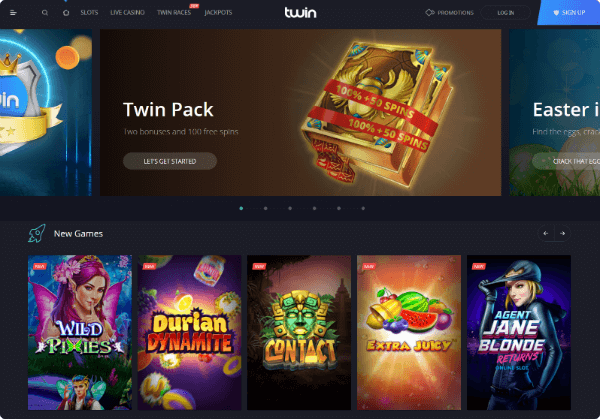 Twin Casino delivers hassle-free gaming by following the rules of their license agreement with the Malta Gaming Authority. Therefore, they take careful consideration when accepting players as not all regions are permitted. However, the great news is, it’s entirely possible to become a Twinner from Canada, allowing Candian players to take advantage of excellent promotions, their award-winning games and much more. If it’s online gaming action you want, choosing Twin is the best choice you can make. They provide well over 700 titles, each from a top-rated game provider. Thus, Canadian players gain the advantage of higher RTP percentages, better graphics and more new releases. The slots variety has become a key feature for new members, thanks to innovative search features and a grand platform of exceptional themes and in-game bonuses. Developers such as NetEnt, Yggdrasil, Play’n GO and Microgaming have made a name for themselves by creating some of the most exciting games available. Not only does Twin provide the classics such as Break Da Bank, Fire Joker and Reel Gems, but include the most amazing new releases as well. A quick visit to the slot page releases all the latest games with a small red label, making it quick and easy to see what’s new. Progressive jackpot games fall under their own category at the top, presenting the biggest reward opportunities from Microgaming, NetEnt and many others. These games offer multi-millions in payouts and cover a broad selection of themes, including Safari themes with Mega Moolah, riches in Mega Fortune and even Greek mythology in Hall of Gods. One of the features that make Twin standout is the searching options on the slot page.  It allows you to choose different developers, game themes and even apply specific bonus features to your search. This saves a lot of time, especially since the filters kick in instantly, showing you exactly what's available for Canadian players with the filters you’ve applied. Furthermore, you get to play the games for free or real money and they include reviews and additional details below each game. Whether you are interested in the most impressive Canadian live dealer games or the most exclusive virtual table games, Twin has it all! The live dealer casino features Evolution Gaming and NetEnt, delivering opportunities on just about any table game you can think of. Not only does the casino include popular standard games such as Blackjack, Roulette, Texas Hold’em and Baccarat, but include modern creations as well. These games take the basic rules and change them into live games with mobile features, including Live Double Ball Roulette, Lightning Roulette and even Common Draw Blackjack among many others. What could be better than a 24-hour support team who always stands ready to give you the latest information at the click of a button. At Twin, Canadian players simply need to press the blue chat bubble in the bottom right-hand corner and get in touch with a support agent instantly. The support team responds within seconds and have been trained to assist with anything from promotional details to accessing their platform on your mobile device. In addition to the live chat option, you can e-mail the support team at [email protected] or fill in their messaging form under the “get in touch” option at the bottom of any page. They also include a vast variety of FAQs, making it easy for new members to learn more about what Twin has to offer! Twin follows the requirements of the Malta Gaming Authority license agreement, which requires them to deliver a certain standard of security while also informing you of any data they collect. The casino keeps their private policy up to date, keeping you informed about any changes. To ensure all your information is 100% secure, they provide an https website with much greater security while also attacked in all of your information with SSL encryption systems.